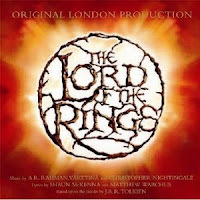 Recently I downloaded a Lord of the Rings musical by the Oscar winning composer, A. R. Rahman. As I’ve been reading the books (I’m in “Treebeard” of “The Two Towers”), I’ve noticed the presents of songs and poetry. It is a significant part, and one of the best parts, of Tolkien’s writing. So when I saw a musical made for it, I thought it was a brilliant idea. Rahman has done a great job, although I don’t think it is the end-all for Lord of the Rings musicals (like perhaps the films are for that medium). A. R. Rahman is from India, and a lot of his previous work has been scoring music for Indian films. What he brings to this production is and ethnic quality that I think is needed for middle-earth. It needs a sound that we haven’t really heard before, especially for the elves, who are the theme of a lot of the poetry and songs in the books. One of the real strengths in this production is how it represents the important aspects of the story. It captures the simplicity of the hobbits, and also the grandness of the issues at hand. I think elvish music should be more ethereal than epic...but the songs here are still good. I especially like “Wonder”.